Network Olympus Monitoring 1.0 released. Take a look! That’s right, guys. Today we celebrate the release of Network Olympus. The strength test has shown that the product is ready to see the light of day! Thanks to your feedback, several bugs were fixed in the final version and the interface was improved. To find out more about the Network Olympus features, visit our website or read the previous post. And now we’re going to tell you about the available licenses and discounts for owners of Softinventive products. Trial mode. This mode is activated immediately after installation. There are no restrictions. The program provides full functionality for 60 days. You can try it out right now. Commercial license. These licenses support from 100 to an Unlimited number of devices. Full functionality, including the ability to apply sensors to groups of devices. When making a purchase, you can choose the period of receiving updates: from 1 to 3 years. All commercial licenses are perpetual. 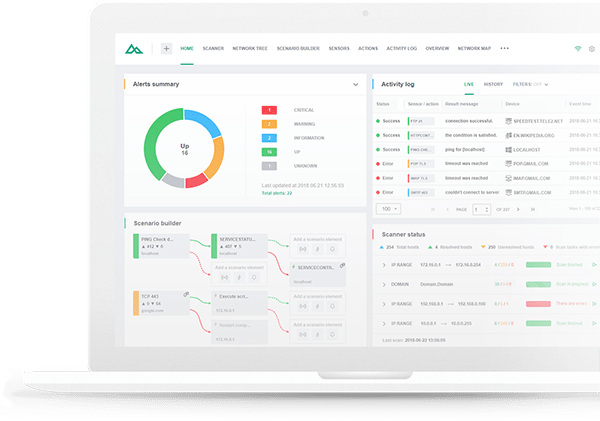 If you already have a license for Total Network Monitor, or one for over 100 devices for Total Network Inventory or Total Software Deployment, then you can get a discount for Network Olympus. Please read the terms for obtaining discounts on this page. Your Olympus is waiting. Sign up! Separately, we would like to thank each and every one who participated in the beta testing. Thanks to you, Network Olympus has become even better! As promised, all participants will receive a commercial license as a gift. The keys will be sent out from November 1 to 9. That’s all for today. You can also read the full version of this post on the new site. We’ll be waiting for your feedback and suggestions. See you soon! Hello, friends! Sensational news from the Total Software Deployment team: TSD 3 has arrived! The number of changes made was so great and the improvements so evident that we decided to up the major product version. NewNew deployment setting in the Software passport: installation context. It allows to specify under which user will the software installer be run. NewNew deployment setting in the Software passport: deployment verification file. It allows to check if this file was created (or updated) on the remote computer as a result of the deployment. NewUninstall support for software installed using the following installers: InnoSetup, NSIS, Smart Install Maker, Excelsior Installer, Ghost Installer, Install Aware, WinRar Installer. NewSupport for uninstalling all versions of MS Office. NewSupport for REG files in the software storage. NewAbility to add multiple programs at once to the software storage. NewHint panels in the software and network trees for getting started with the storages. NewSoftware tree and network tree can now be hidden. The storage loading progress is now also available in the status bar. ImprovedMacro deployment of MSI packages now works on computers where interactive services are disallowed. ImprovedBitness of the interpreters that are used to execute scripts now matches the target system bitness. ImprovedSoftware with unspecified bitness and installation context is now marked with the /!\ icon in the software tree and the software deployment list. ImprovedAdding of single-file installers made easier. 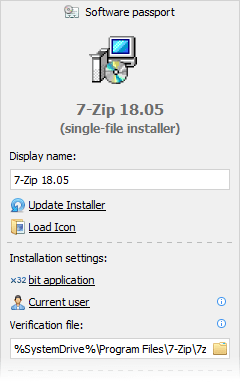 Now it’s enough to just select the installer(s) in the file open dialog. ImprovedThe size of the deployment and uninstallation logs can now be changed. ImprovedDouble click on the program in the software tree now adds it to the software deployment list. ImprovedDouble click on the computer in the network tree now adds it to the deployment targets list or to the scanner’s task list (depending on the selected TSD mode). FixedDeployment of software that requires the environment variables of the user. FixedInteraction with the software component selection list during the Macro deployment. FixedFreezing that occured with some installers at the very beginning of installation when deploying using the Macro method. FixedWorking with some MSP files. + Many other fixes and improvements. The full changelog can be found on the update screen in the program itself. Several changes were made to Software editor’s Software passport. The first thing you’re bound to notice is a more convenient placement of elements in the passport. There are two new settings too. 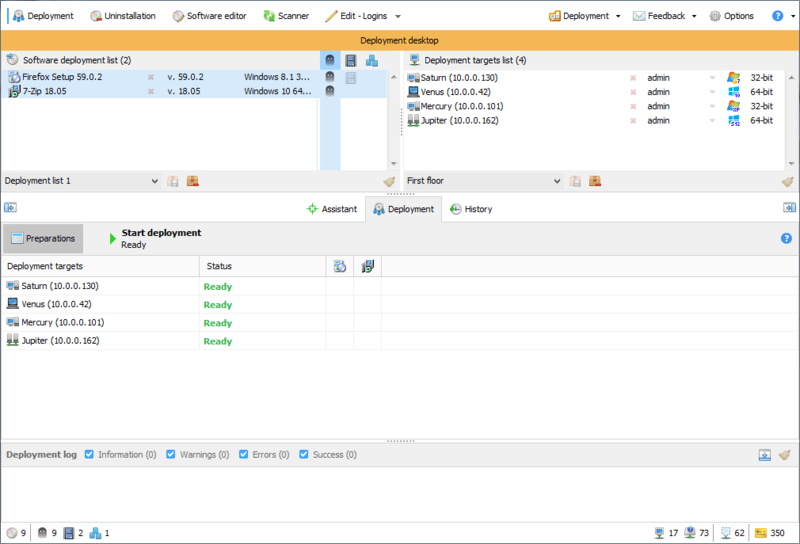 The Installation context setting allows to select with what privileges the deployed software installer will be run. This setting is very important for the correct installation of programs that require a particular installation context, as well as for executing scripts. Select the local system installation context for programs that are installed for all users on the computer. This is the simplest and most common scenario, so we recommend to use this context most often. However, there are programs that can be installed only for the current user, and that’s the name of the context that you need to select in these cases. As you may have already guessed, someone must be logged into the system at the time of deployment for there to be a current user. The final option for installation context is network administrator. It’s intended solely for running scripts on the remote computer when they require access to remote network resources. Setting up the Deployment verification file will allow you to save valuable time and make sure that the program was installed correctly without rescanning the target computers. Just specify the path to one of the files that must be created or updated on the remote computer during the deployment process. TSD will check it and show the result in the deployment log. If you deploy scripts, then you can verify their execution as well in this way. Significant improvements were made to the Macro method and positively affected the deployment success rate for packages created using this method. Now there’s full deployment support for computers configured not to allow interactive services (the default setting for Windows 10 and 8.1), and more elements of the installer’s interface can be interacted with when recording a macro. All these improvements allow us to safely recommend that you use the Macro method in all cases where the Silent method doesn’t allow you to configure the installation exactly the way you want it. And last but not least in this section: after numerous requests, .reg files can now be added to the software storage for their further deployment. As we’ve promised, the list of installer formats supported for uninstallation was heavily expanded. Right now, software uninstallation is supported for all popular types of installers. Specifically, the update adds support for InnoSetup, NSIS, Smart Install Maker, Excelsior Installer, Ghost Installer, Install Aware and WinRar Installer (device rescan required). We’ve also paid special attention to MS Office: uninstallation of any packages of this popular software is now fully supported. The process of adding new programs to the software storage is no longer unnecessarily cumbersome. Now you can add as many installers at a time as you want, and less actions are required of you overall. For new users, we’ve added useful hints that will help them to get started with TSD. And so now you should be aware of all the new things that were added in the third version. Have we managed to surprise you with anything? Download the update and try them for yourself. We’re positive that you won’t be let down! The update is already available to all users via the usual link on our website or in the program itself (Help – Check for updates). System Administrator Appreciation Day 2018! Dear readers, are you ready for Friday? 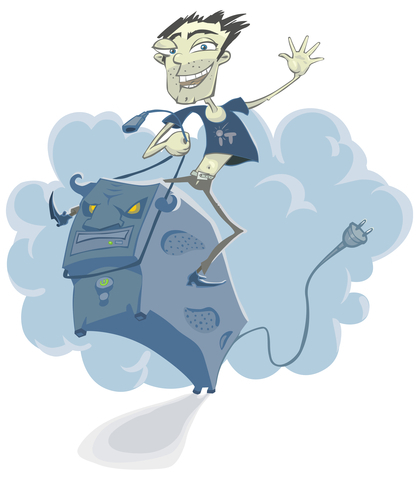 July is coming to a close, and that means it’s almost time to celebrate System Administrator Day! The holiday is on July the 27th. We’d like to sincerely congratulate all admins on this wonderful day! You are the true heroes, quietly preserving the peace and order in corporate networks. May the force be with you! The discount is applied automatically when you order from our site. And what is a holiday without gifts?! Starting July 23 and during the next 5 days, we’ll be handing out Total Network Inventory and Total Software Deployment licenses for 25 devices to anyone interested. To receive your license, send us an email!